Washington, DC — Want to buy great, energy-saving products but not sure which ones? To help consumers make energy-smart choices, the American Council for an Energy-Efficient Economy (ACEEE) and Enervee are partnering to give shoppers new tools. These free resources combine ACEEE’s efficiency expertise with Enervee’s data, analytics, and marketing capabilities to make it easier for consumers to find quality products that reduce their energy bills. 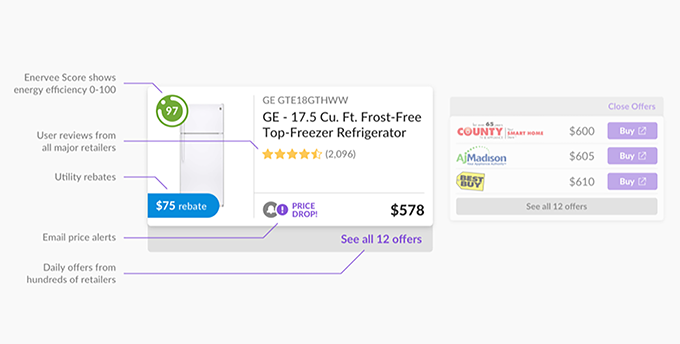 When the time comes to purchase a new product, such as a refrigerator or TV, shoppers can visit the SmarterHouse website (smarterhouse.org) to find ACEEE’s trusted energy-saving tips and buying guidance. There they will have access to a snapshot of the most-efficient product models available today, featuring the easy-to-understand 0 – 100 Enervee Score. Once shoppers are ready to buy, they will be directed to Enervee’s portal (choose.enervee.com) where they will find detailed product information, pricing, and incentives offered by their utility. This streamlined, integrated process makes the efficient choice the obvious one for consumers, including the nearly 500,000 unique visitors who turned to SmarterHouse in 2017. “As a one-stop shop that combines ACEEE's tips for buying new energy-efficient appliances with Enervee's super-efficient product offers (updated daily), SmarterHouse now provides an easy way for visitors to move from research into action," said Jennifer Amann, ACEEE buildings program director. "Enervee's unparalleled access to real-time consumer product data makes the innovative firm an ideal partner for ACEEE and SmarterHouse." ACEEE and Enervee will pass along key takeaways to consumers via the SmarterHouse Energy Saver blog and to energy efficiency professionals via ACEEE’s blog. For example, Enervee tracks model-level retail price offers and product market trends, offering a rich dataset that can provide insights into online shopping behavior, effective messaging, and consumer response to utility program offerings. The partnership, announced today, builds on a history of cooperation that began with ACEEE’s support of the transition from the nonprofit TopTen USA to Enervee back in 2014. As members of TopTen USA’s board of directors at the time, Enervee vice president of market development Anne Arquit Niederberger and ACEEE executive director Steve Nadel recognized the opportunity to shift from a grant-funded model to a venture-backed approach that could deliver a superior, data-driven solution for utilities and consumers. For interview requests and questions about Enervee, media should contact Kyle Schee at (805) 973-7534.